MECCANICA H7 has created, in collaboration with universities, an internal department of Research and Development for a more advanced approach in the field of mechanical and electronic appliances, concentrating more on innovation. The activity takes place within a certified system of Project Management that reckons with technological experimentations and with market economic implications. The result is a great innovative vitality in various industrial applications and a technical and economic competitive advantage. 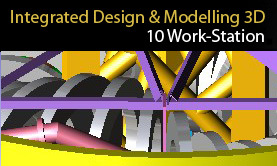 Cutting-edge tools for design, calculation and three-dimensional modeling always renewed to minimize feedback times. From the idea to the final testing and then afterward to the updating of the starting model, the main theme is the search of quality and efficiency.